I have plenty of photos for this week, and didn't have much difficulty in choosing which ones to post. Oddly enough, it turns out that all of those I chose were shot today. 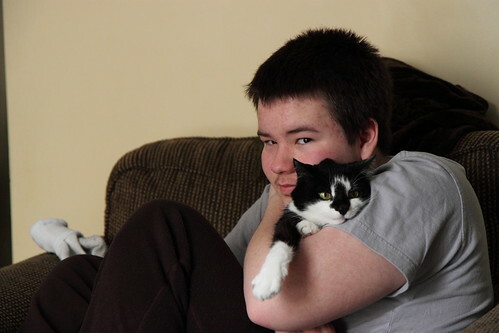 First up, is my son hugging our cat. Our cat is 17 years old. My son is 15. It's only been in the last two or three years that she let anyone, aside from my wife and I, go near her. She used to be extremely timid and cautions of our kids. I'm pretty sure she lost her hearing in the last two or three years, which seems to have contributed to her calming down. Sounds weird, but I can't explain it any other way. She'll even sit in his lap as he uses the computer. They're best friends now. 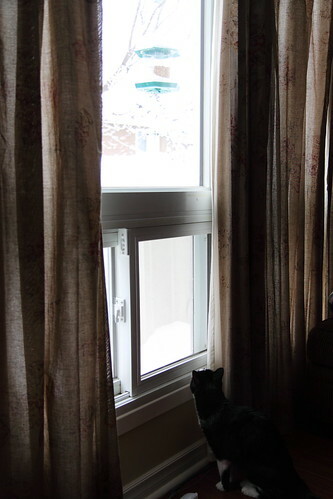 Sam watching the bird feeder and "chattering" at the birds. 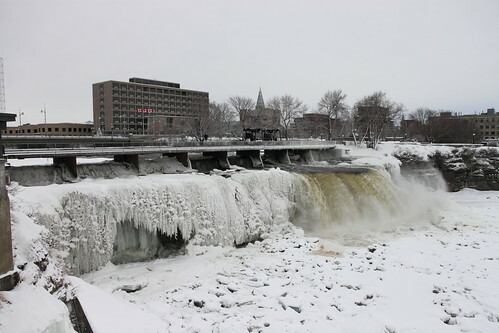 Today I took a trip out to Rideau Falls, with the hope that I'd be able to shoot massive chunks of ice piled up at the bottom of the falls. They did the ice blasting last weekend. It was not to be. Maybe I'm still too early? It was damn cold with the wind coming off the river though. 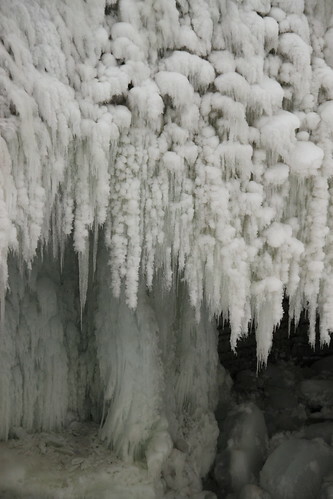 A closeup of the cool ice formations at Rideau Falls. 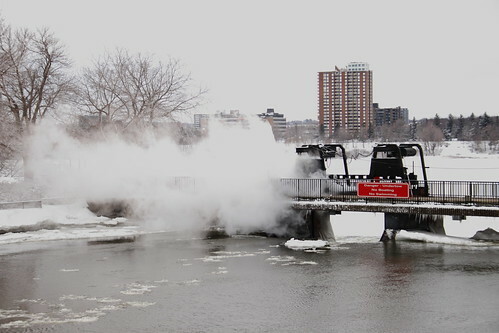 I saw a couple of workers on the bridge just before leaving Rideau Falls. I think what they were doing was thawing the sluice gate with hot, pressurized water. There's a somewhat humourous story to these next two. 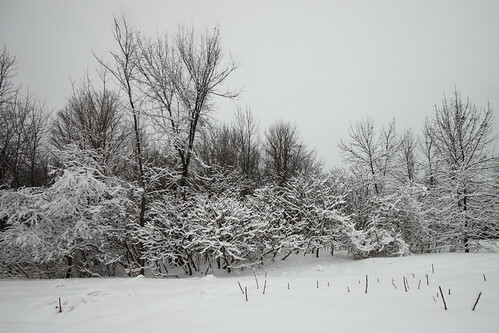 As I drove to Rideau Falls, I passed a cool, snow covered tree that I thought would make a great photo. I decided I would stop on the way back and shoot it. So I did. Kinda. In the winter, there's only one parking lot open along the Rockliffe Parkway and I knew it would probably be a fair walk to get to the tree. I parked and walked. And walked. And walked. In foot-deep snow. I kept thinking it had to be "soon". I couldn't find the damn tree. Either that or it looked much different than what I saw when I first passed it. 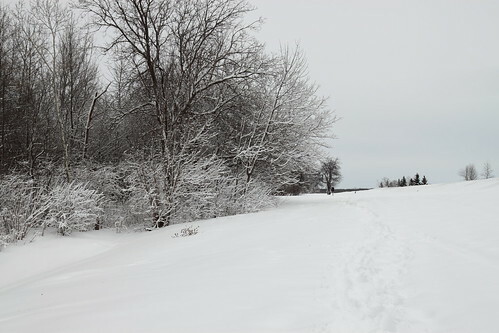 After about 30 minutes of wishing I had brought my snow shoes, I knew I had to be mistaken about what it looked like. On the way back, so my walk wasn't all for nothing, I shot some of the trees. This isn't what I saw, but it's still cool nonetheless. At least I got some decent exercise. I also realized that it didn't tire me out as much as it used to, when I smoked and was more out of shape.